We're fast approaching the month of August which means that horse show season is in full swing across the country. Top riders and their horses are hooking up their rigs, as recreational riders travel with their horses to hit new trails, and others transport horses that they've sold to their new homes. Regardless of why you're planning a long haul with a horse, there are some important steps that will help you to prepare for a safe and efficient journey. This includes planning rest stops where you'll want the opportunity to stretch your legs, as well as your horse's. If you've been on the road for hours, it's important to get them moving and give them the opportunity to drink. It can be comforting for them to spend even a few minutes with you when they're off the trailer. This also means planning where you'll stay overnight, if you'll be hauling your horse far enough to warrant it. If you're a seasoned traveler then you're probably already aware of the options, including board bed and breakfasts, horse motels, stables where you can also crash, campgrounds and other horse-friendly options. Sometimes plans can fall through, however, so it's important to have a backup option. When you're making your way across the country with a horse, you can't just stay at the next motel along the Interstate. Familiarize yourself with the requirements for the states you'll be entering. You'll need proof of vaccines for all animals, proof of ownership (not necessarily required, but a positive thing to have), a 30-day health certificate, and a coggins test completed within the last 6 months to 1 year. Fail to produce any of these documents when asked at a show, lodging venue, or other location and you may find yourself turning your rig around to head home. Don't ever find yourself left without a way to house your house outside of the trailer. What if you can't make it to the place you were planning to stay, and there's no other alternative nearby for both you and your horse? 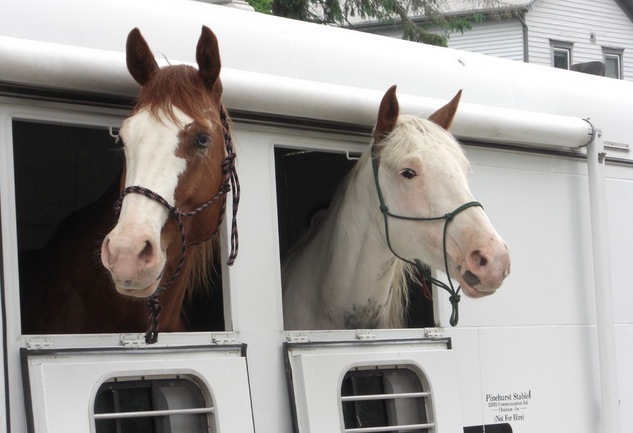 Local campgrounds and parks may allow you to setup your own confinement space for your equine to spend the night in, and you always have the option of crashing in the truck. A horse just can't sleep anywhere, so in a pinch having a collapsible pen is a great option. Even if your truck and trailer have recently been given a clean bill of health, do a complete safety check yourself before you hit the road. You should do more than simply check your truck and trailer; also give our horse a quick health check to ensure that he/she is ready to travel. Wherever you plan to take your horse before the summer season is through, these tips will help you reduce the stress associated with a long haul. Have fun on your adventures!